In honor of National Coming Out Day on Oct. 11, Facebook unveiled a new update Wednesday to its “Major Life Event” product. 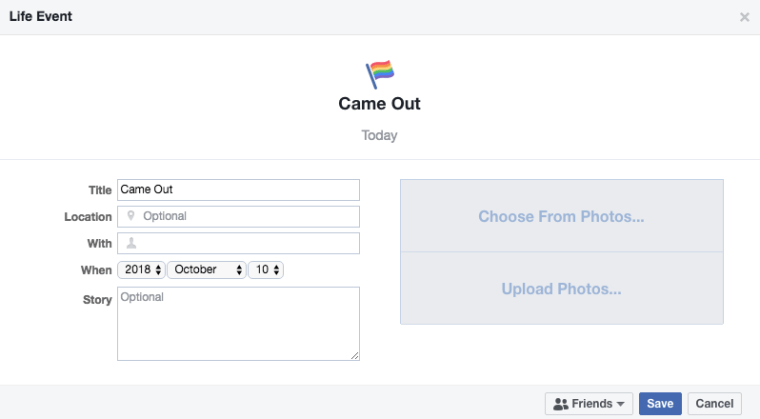 Now, Facebook users can select “Came Out” and share their own story. To add “Came Out” as a major life event on Facebook, users can tap “Life Event” in the composer window on their timeline. Then, choose “Family & Relationships” in the drop-down menu (or just “Relationships” if you’re on a mobile phone), and then select “Came Out” in the list of life events. While the addition of coming out as a major life event may be new on Facebook, LGBTQ people have been coming out on the social media platform since its launch in 2004. Sam, who identifies as “trans-fem nonbinary” and asked only to be identified by their first name, is one of them. Sam came out Monday on Facebook — two years after coming out to family and close friends. Sam, who uses gender-neutral pronouns like “they” and “them,” said they especially wanted to share their unique experience as a nonbinary person. “Being socialized as a man and then transitioning to a feminine presentation and experiencing the deep reality of sexism feels important to share in this moment,” Sam explained. After coming out publicly on Facebook, Sam said they received an outpouring of support.